My husband claims that since this has no meat in it, I cannot call it chili. Moreover, “chili” with beans is not chili, either. I’m not sure who makes up the rules, but this is called Vegetarian Chili in Simply in Season. Cook beans. I used the traditional method: soak overnight, rinse well in the morning, bring to a boil, then simmer for about an hour. In a large soup pot, saute’ the sweet peppers, onion, and garlic in a little oil. Add tomatoes, salt, and sweetener of choice and bring to a boil. 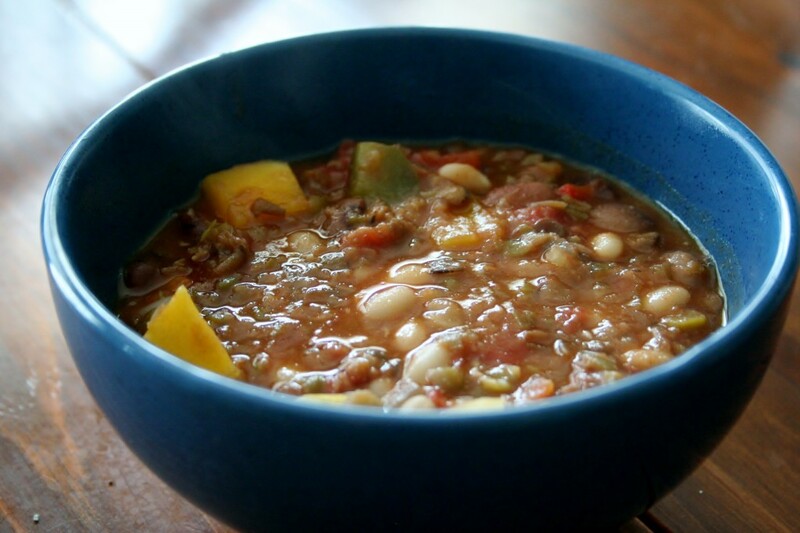 Reduce to a simmer and add the beans, squash, jalapeno pepper, chili, and cumin. Simmer for about 45 minutes. The Verdict: I’m not really sure why the butternut squash is necessary, because I couldn’t really taste it, but it was pretty to look at. The chili had a great flavor, and because of the lentils in the bean soup mix, it almost seemed like there was ground beef in it. You’ll need to use a very large pot, and plan for leftovers. It’s a great weekend recipe so you can have lunches for the coming week. Oh, and this is one recipe where DH didn’t say “this would be great with chicken in it.” He said, “this would be great with chorizo in it.” Sigh, I never win. Although I DO love locally made chorizo from Creswick Farms. Looking for more veggies as a main dish recipes? Check these out! Grandma Pizza with Dried Tomatoes by Get the Good Stuff! I did enjoy a large bowl of this for dinner tonight. Added some cheddar cheese. Found you from Rook No. 17. This looks really good, I like the option to make a good chili without meat! I think I may try it without the squash! In this week of Thanksgiving I especially want you to know how grateful I am to have you be a part of the creative spirit and camaraderie at Rook No. 17. Thank you for linking up to “A Little Birdie Told Me…”! I bet the squash adds sweetness and nutrition. This sounds really tasty! Have you thought about cooking your beans in a pressure cooker? I bought my pressure cooker after staying with a family in Nicaragua, who cook 3 pounds of beans every week (using a pressure cooker). I cook two or three pounds at a time and freeze what I don’t use right away. The pressure cooker saves both time and energy, and the beans are cheaper and taste better than canned. oooh Andoille would be great! Sounds delicious to me. Great dish to make ahead and freeze for leftovers! In this case, the name of the dish is clearly not as important as the taste. Thanks for participating this week! I know this was delicious. I have used pumpkin in a very similar chili and it was great. I wonder if the lentils will trick my Grumpy? 🙂 I will add the butternut squash, we love it so much, I am soaking my beans this morning and will be making this when I get home tonight. I’ll let you know how we liked it. Can’t imagine not! Sounds wonderful. Sounds like a tasty chili to me!